This post attempts to summarise a Twitter thread about how to encourage student questions which went viral in August 2018. @MrsSasser ’s initial post explained how apparently small changes in the way she asked students if they had any questions had a massive impact on the number of questions that they asked.Similarly, most of the other suggestions appeared to be based on practical experience of using them and finding that they had a positive impact. Only ask for questions if you genuinely want them (@JaneBIVL's tweet ). If you don’t want questions but feel you have to ask for them, then put your hands up with the palms facing the students/audience and ask ‘Are there any questions?’ (@DReed67's tweet) . Tell students at the start of your input that they will HAVE to ask at least one question at the end (@dylanwilliam's tweet). Make sure you do then give them the opportunity to ask questions at the end. Closed questions can usually be answered with a single word and/or have a pre-determined answer. For example, 'Did you understand that?' could be answered 'Yes' or 'No'. What is the capital of England has one correct answer ('London'). Open questions in contrast tend to require a longer answer and there isn't a pre-determined 'correct' response. For example, 'What do you think about ...' or 'How do you feel about ...'. 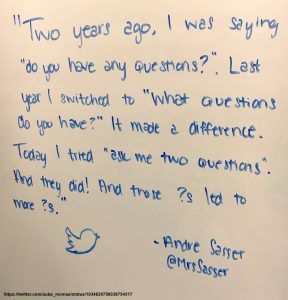 To encourage students to ask questions switch from from asking ‘Do you have any questions?’ to ‘What questions do you have?’ (@MrsSasser's tweet). Rather than asking if your students have any questions, assume that they have, for example by asking ‘Now, what’s the first/next question?’ (@ellis2013nz's tweet) or the more directive (and thus more likely to be obeyed) 'Ask me two questions' (@MrsSasser's tweet). One of the reasons that students are reluctant to ask questions is that they are uncomfortable being seen not to understand - and asking questions is often framed as being a sign of the student's lack of understanding. However, you can shift the 'blame' for not understanding from the student to the teacher by switching from asking 'Do you understand?' to asking ‘Did I explain that clearly?’ (@MirjamHommes' tweet). Moving from ‘Any questions?’ and ‘Does that make sense?’ to ‘What do you not like about that?’ or ‘What doesn’t make sense?’ (@BenGitsCode's tweet) similarly reduces the potential stigma of 'not understanding'. As does asking ‘What questions does this raise?’ because it shifts the focus from the question asker to the teacher (@sean_mccarron's tweet). Where students are particularly reluctant to ask questions you might try ‘What questions do you think that someone else might have?’ (@JoyCoates1's tweet) as this also shifts the focus away from the question asker. Of course asking questions may not be a sign of misunderstanding or confusion at all. You can signify this by having students ask questions starting with 'Is it correct that <insert something that they have understood>?' which also has the advantage of giving you an insight into their thinking (@jufknoben's tweet). Alternatively you could ask them ‘What more would you like to know?’ rather than ‘Questions?’ (@agentlibrarian's tweet), which again doesn't imply that they have misunderstood your input. Coming up with questions isn't always easy. You need to allow your students thinking time to formulate their questions (@eajayi24's tweet). One strategy for doing this is to end your input by saying ‘A question I get asked is …’. This avoids a pause whilst people think up questions and gives permission to ask additional questions without ‘being the first to ask’ (@marty_mcdonough's tweet). An alternative is to tell your students to ‘Write down two questions that you have’ (@ShaneBDuggan's tweet) or to note two things they noticed or wondered (@DeborahHuggard's tweet). These strategies give thinking time and suggests that everyone will have questions/things they wondered about, so reduces any potential stigma. If you want to encourage someone else to speak then its more effective to say ‘Who else?’ rather than ‘Anyone else?’ (@MaryWittTN's tweet) or ‘What else?’ rather than ‘Anything else?’ (@l_f_seymour's tweet). It is also helpful to reinforce that you value students asking questions with comments such as ‘Good question’ and ‘Thanks for the question’ (@dherrera1911's tweet). When nobody has a question ask ‘If you did have a question what would it be?’ (@Jhietpas1's tweet). Alternatively, start to ask questions yourself about the topic (@KevinStoner93's tweet). Another good strategy is to provide mechanisms for students to ask questions anonymously, for example by providing post-it notes for them to write their questions on (@prosechic's tweet; @DrTimLondon's tweet); or by providing a drop box by the classroom door (@cjguillaume's tweet). If you want to be a bit more high tech you could use something like surveymonkey to allow students to ask questions anonymously either during the class or later on (@Cari_Izza's tweet). Of course it is important to maintain the student's anonymity both when you collect their questions in and when you respond to them (@prosechic's tweet). If answering questions after the class has finished then you could record the answers as MP3s and post the answers online (@DrTimLondon's tweet). Contributors to the Twitter thread suggested a range of other resources that might be relevant (and I've added a one too). Dan Rothstein & Luz Santana (2011) Make just one change: teach students to ask their own questions. Cambridge (MA): Harvard Education Press. 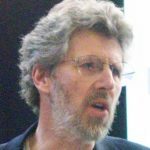 If you have other examples of great techniques for enhancing students' questions or increasing student agency then let me know - leave a comment or use the contacts page to get in touch.